In this piece, we discuss how to clean mold from front load washer gasket. We feel that your first, best strategy, is to keep the gasket from getting moldy in the first place. Keep it dry when the washer is not in use. Wipe it dry after each clothes washing session. Then, if mold does appear, it’s generally pretty easy to clean if you get to it right away. Avoid allowing mold to accumulate. Clean it when you see it. Use the least abrasive methods and gentlest cleaners first, and save the harsher ones for only those times when that mold just won’t come off. We detail all of this below. The best way to clean mold from a washer door seal, is to avoid the mold in the first place. Stop it before it starts, and act immediately if you notice any dank odors coming from your laundry machine. Typical Apartment Size Bosch Front Loader Clothes Washer. How to clean mold from front load washer gasket. Keep the seals dry when you’re not using the washer, and we also suggest using only liquid laundry detergents, to avoid possible buildup of soap residue that can occur with dry, powder laundry soaps. Avoid using too much laundry detergent, which can exacerbate soap residue deposits. Also, be sure to run your front loader through the manufacturer’s suggested cleaning procedures at least once per month, to further retard mildew growth. Avoid allowing wet clothes to sit in the closed washer for very long after the wash cycle completes, as this will create lots of warm, moist air inside; a perfect breeding ground for mildew and mold spores. But when there’s no foul smell, and you’re just performing routine washer maintenance, wipe in and around the door seal with a water-moistened dishcloth or sponge after each laundry session, to rinse off any remaining laundry detergent residue. Then wipe the entire seal dry with an old but clean dishtowel. Finally, do not close the door completely when you’re not using the washer. Leave it open. You want to allow fresh air into the wash drum and seal areas to promote faster internal drying as well as to prevent the accumulation of moist air and the resulting condensation of water on the seal. Keeping your washer as dry as possible when idle helps keeps the mold and mildew away. You should perform one or more of the steps below if you find any deposits or stains on the seal that damp-wiping alone does not remove. 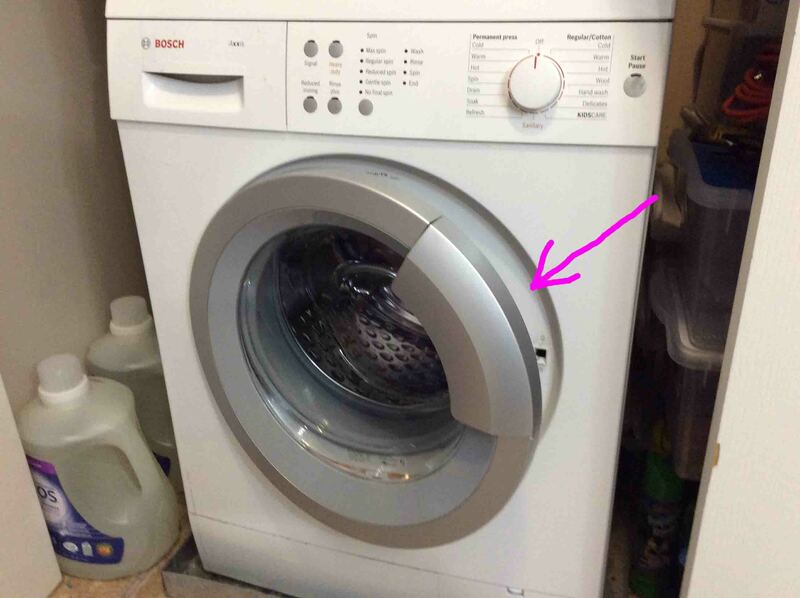 Typical front loader washing machine, with its door slightly open, to minimize mold and mildew growth on the gasket. Hard to remove all the stubborn mold and mildew without damaging the door seal; particularly on older front loaders, which have seen many hours of laundry cleaning operations. So, we’re not after a pristine cleaning here; only to clean the seal enough that it continues to function well as a seal, and not leak. We also wish to remove any mold and mildew odors from the washer, that might be originating in the seal crevices, as shown in the cover picture above. Further, we’ve found that when the front loader does begin to smell bad, cleaning the door seal really does not reduce the moldy odor very much. To do that well, you need to thoroughly deodorize the inside of the washer, as described in our How to Freshen Up a Smelly Washing Machine article. Soapy water alone yields little cleaning success in our tests. We found that It only removes the loosest mold, mildew, although it is pretty good at getting out the slime. An advantage of just soap though, is that it smells the least bad. Plus, it’s easiest on your clothes and hands, and generally does not dry out your skin. So, we suggest trying the mildest cleaning methods like this one first. Then, only graduate to the more caustic ones when soap alone does not remove the mold stains. White vinegar is a bit more acid than mild dish soap, and may prove more effective at removing the black mold stains from the seal. Plus, you don’t have to worry about what will happen to your clothes if you spill some on yourself. Be sure to read its safety instructions first, to verify its suitability for front loader washer rubber seals. We suggest Clorox Cleanup. We’ve used straight bleach with low to moderate success. Oh, the bleach indeed disinfects the seal as well as removes any musty, damp smells from it. But we’ve found, even after allowing even full-strength bleach to soak on the mold stains for ten minutes or so, the bleach only cleans so well. Even the strongest cleaning solutions may not entirely remove black mold stains without risking damage to the door seal. A bleach solution does however, disinfect, and so therefore, eliminates any damp mildew smell from the seal. However, we suggest allowing the bleach to soak on the seal for a half-hour before scrubbing with a damp dish cloth or nylon pot scrubber pad. Do not use metal-based pot scrubbers on the delicate door seal, as they might scratch it, and thereby decrease its water-sealing effectiveness. 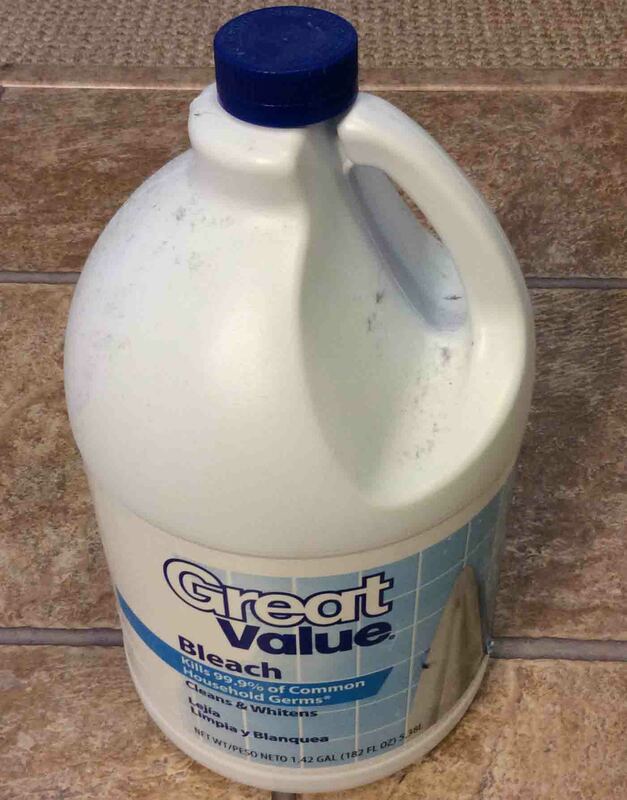 A bottle of Great Value brand bleach, front view. How to clean mold from front load washer gasket. If none of these tips for how to clean mold from front load washer gasket works, and you find the black stains unsightly, then hire a washing machine repair technician to install a new gasket. But as long as the sealing gasket is not leaking and not smelling, we suggest against replacing it, unless of course, you have extra money that you’re just itching to spend on something. Black mold stains are tolerable and not harmful, so long as you’ve removed the loose spores with regular cleanings. 2019-03-29: Improved key phrase targeting.